Torquay United manager Kevin Nicholson is confident his side will soon start improving their scoring record despite the 0-0 draw at Braintree. The Gulls have scored just twice in the last five games, and have conceded 10 goals in that time. "The attacking stuff will come," Nicholson told BBC Radio Devon. "But it's pretty obvious to see with our defensive record over the season that if we put the work in like that we get the clean sheets." 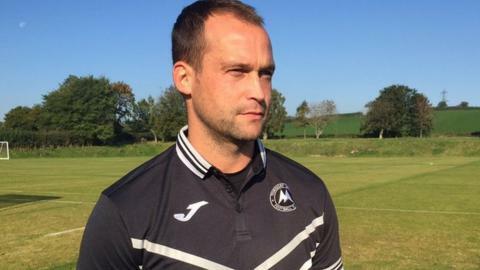 The draw did little for Torquay's overall league position - they remain third-from-bottom in the National League. But Nicholson said he was pleased with what he saw after a 3-1 loss to Lincoln and a 4-0 defeat at Barrow in their previous two matches. "We showed that there's no quit in that team, there's no quit in me," he added. "Yes, the past couple of weeks were tough on us, but the lads have come out there and they've given every ounce of everything that they've got to make sure that they don't concede. "They've worked very hard this week, we'll work even harder next week to make sure we take that next step."